AMD's latest incentive program is being interwoven into its existing app, which promises to reward PC gamers for some of the tasks they likely already perform when playing games. The AMD Gaming Evolved app doles out points and eventually prizes for using AMD Radeon and AMD APU-based hardware and completing actions like optimizing the image quality of a game and playing a game identified by the client. The Gaming Evolved dashboard also recommends optimal game settings tailored to a gamers' rig, keeps drivers up to date and adds tools like chat and live streaming. The Windows-based app can be downloaded from the graphics company and social gaming-based network Raptr starting today. 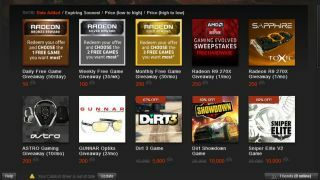 The most notable AMD Rewards include Sapphire Radeon R9 Series GPUs, Astro gaming headsets, GameFly subscriptions, Gunnar gaming eyewear and of course free games. In total, the company says that the AMD-exclusive store has more than $5 million (about £3m, AU$5.5m) worth of merchandise on hand. AMD isn't a stranger to offering incentives for using its hardware over its chief rival, Nvidia. The company has been running bundle programs that offer free games with graphics card purchases for several years. Read our PS4 and Xbox One reviews to see how the consoles stack up.